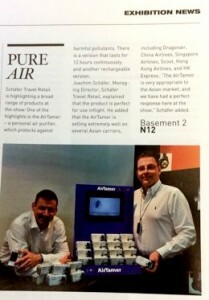 The AirTamer A302 recently earned much attention at an exhibition where it was presented by Schäfer Travel Retail, which highlights new and exciting brands that beautifully complement the travel retail business. The AirTamer A302 air purifier is the world’s most effective travel air purifier and is proven to filter 875% more air pollutants than its closest competitors. The AirTamer A302 high performance travel air purifier has always been a favorite of travelers for its ultra-compact size and state-of-the-art electrostatic purification system that guarantees clean, healthy air around you for breathing. It emits a constant stream of healthy negative ions that push viruses, bacteria, pollen, germs, dust, and other airborne pollutants away from your personal space. With the allergy season at its peak, the AirTamer A302 travel air purifier helps you breathe in cleaner, healthier air whether you are in a plane or inside commercial buildings. You can wear it around your neck (strap included) since it is smaller than most MP3 players. You can also clip it to your shirt or blouse (includes integral clip) or stand it freely on a nightstand, desk or table so the air around your pillow is clean. The “on” indicator light gently blinks to indicate it is cleaning the air. The AirTamer includes a metal travel case to protect the air purifier when not in use. Maintenance is easy since there are no filters to replace. Buy the AirTamer A302 travel air purifier to keep your air clean.